No factoid highlights the improbability of John Brooks scoring the game-winner for the United States quite like this one: Until he came on as an injury sub at the half, he was still technically eligible to play for Germany. A dual citizen, born and raised in Berlin by an American serviceman father and a German mother, this was just Brooks's fifth international appearance with the senior team, his first in a non-friendly, so it was only when he subbed in for Matt Besler that he was officially committed to the USMNT for life. Though he's never lived in the U.S., it took the center back just 40 minutes of play to make sure he never has to buy a drink in this country—Even if that was six minutes later than he'd dreamed. "I had a dream [two nights ago]," Brooks said. "I told some teammates that I dreamed that I scored in the 80th minute and that we'd win the game. It was the 86th minute and we won." Close enough. We don't yet really know what we have in Brooks, who beat out Clarence Goodson for a spot among this team's center backs, alongside Besler, Geoff Cameron, and Omar Gonzalez. The 21-year-old is a product of Hertha BSC, coming up through the Berlin club's youth system, and making his Bundesliga debut last summer. He showed enough to get a look from the Germans, being invited to an U20 camp, but always maintained that his future was with Team USA. "The United States is still my first choice," Brooks said in 2012. "Playing for the German team was O.K. but America was a lot better." 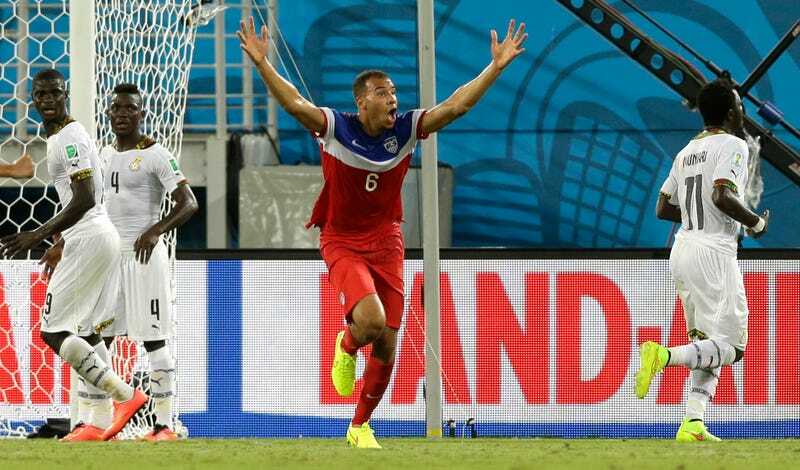 Cynically, we'd note that Brooks wouldn't sniff the German roster, but that's cool; we're happy to have him. All 6-foot-4 of him, every inch needed for his header on a corner from Graham Zusi that made him just the fourth American to score a World Cup winner in the modern era. Earnie Stewart, Brian McBride, Landon Donovan, and now John Brooks. "John showed his talent," Jürgen Klinsmann said. "Does he have a lot to still learn and grow? Yes. It's just normal, but what better stage to do that than the World Cup?" This was, everyone presumed, Klinsmann's justification for many of his roster selections. There's new blood flowing into the USMNT, but it's not quite ready yet, so why not give the kids including Brooks some World Cup experience? It's also the first (and likely the last) World Cup for 32-year-old Jermaine Jones, who should have been the U.S.'s man of the match. Like Brooks, Jones is the son of an American serviceman stationed in Germany, and like Brooks, he is a player who took advantage of FIFA's lax nationality rules to salvage an international career. "Those guys are as American as apple pie," Kyle Beckerman said of the German-Americans. "Ask them to sing the national anthem and they will." Though Brooks gets the headlines, the U.S. only survived thanks to the defensive midfield play of Beckerman and Jones. Formerly rivals for a single spot, they were freed up to play together by a tactical change by Klinsmann, moving to a 4-3-2-1 "Christmas tree" formation. With Michael Bradley horribly and uncharacteristically overwhelmed, it fell to Beckerman and Jones to bail the USMNT out—and on Brooks to steal a win. Brooks, Jones, and Beckerman, the three most important men to the U.S. yesterday, represent a telling cross section of where this team has been, and where it's going. On one end, Klinsmann's international-infused, unproven youth movement. Bridging the gap, a German-American veteran, only now getting his chance on the biggest stage. And on the other end, a graduate of the same IMG Academy 1999 class that produced Landon Donovan, Oguchi Onyewu, and DaMarcus Beasley. This is supposed to be a transition tournament for the U.S., all the victories foundational. But against Ghana, present and future achieved something real. Moral victories are nice; three points are nicer.